Earlier this morning, as rumoured, Apple announced a new (PRODUCT)RED iPhone 7 and iPhone 7 Plus colour option, set to launch this Friday, March 24, priced the same as 128GB and 256GB models. The Special Edition (PRODUCT)RED is already being sent out to select reviewers in the U.S., including influential YouTube tech reviewer MKBHD, known as Marques Brownlee. 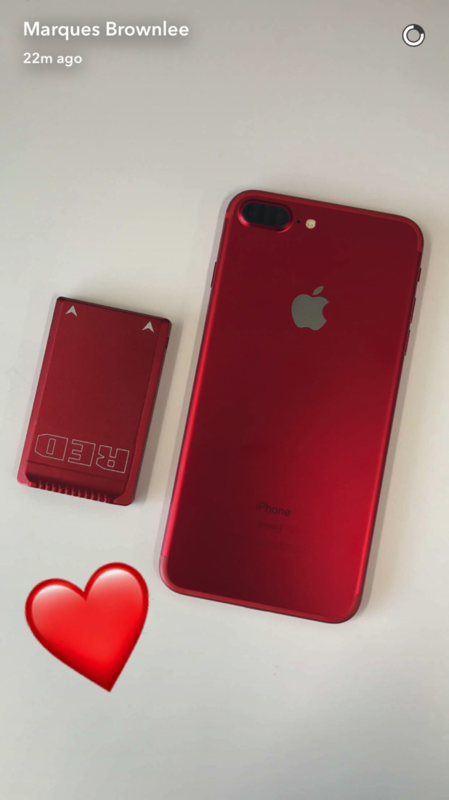 He shared a teaser picture of his red iPhone 7 Plus on Snapchat (thanks @JTechApple). The back of the (PRODUCT)RED iPhone 7 Plus has a shiny silver Apple logo. Next to the iPhone 7 Plus is a red battery for his 8K Red Epic-W camera, which, you know, can start at $29,500 USD. Anyways, expect hands-on videos of Apple’s (PRODUCT)RED iPhone 7 and iPhone 7 Plus to hit YouTube soon from MKBHD, and most likely from Jonathan Morrison as well. Anyone going to get a red iPhone 7 or iPhone 7 Plus? Would make a great way to celebrate Canada’s 150th birthday, am I right? That’s it, my Jet Black iPhone 7 Plus is heading for the trash can now.